Parts and spares for slitter rewinders and other converting machinery. Fast access to spares is crucial when trying to keep your machines efficient, operational and online. We hold a large stock of commonly required spares for most third party machines here at our Ipswich headquarters, and have developed a speedy system for fabricating or sourcing more obscure parts. Our engineers can react swiftly and flexibly and are able to reach most of Europe with short notice. Universal Converting Equipment is sold and serviced worldwide, giving us a great deal of experience in getting issues resolved quickly, and with a minimum of stress for our customers. 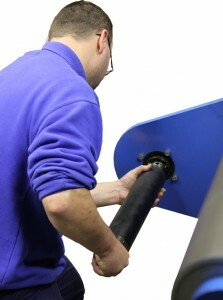 We are often able to get engineers out to customers’ machines considerably quicker than our competitors.